When I saw the pig-shaped pear (or is that a pear-shaped pig?) I wanted to put it on a pizza. And pears go great with goat cheese--so another layer of flavor was there. What I couldn't decide was what else would go on the pizza. I love goat cheese and fig jam, but I wanted to try something more savory like caramelized onions with the pear. I was mulling this over when I went on my near-daily milk run, and asked the cheese monger at my local grocery store for advice. She echoed my fig jam thoughts. So I did what any good food blogger, even a very new food blogger, would do. I made a bunch of pizzas and took separate photos of each so that I can pull multiple Farm Fresh Feasts Friday Night Pizza Night posts out of one meal! 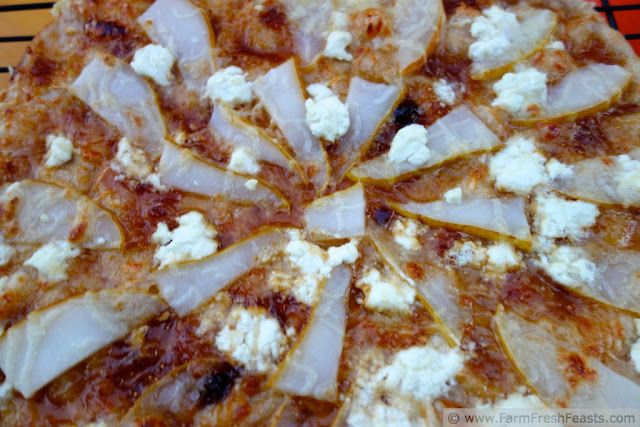 Tonight's pizza is the fresh pear, fig jam, and goat cheese version. I had help on this undertaking. My kid decided to help out with photography so I didn't have to keep washing my hands in between steps. She was taking "action" shots of the pizza. Some of them I really really like. I took the ones at the end that are less artistic but do let you see the entire pizza. Action shot-pears, goat cheese, and jam. That's 3 pizzas worth of dough. And my favorite fig jam. Preheat oven to 450 degrees Fahrenheit. If you have a baking stone that lives in your oven, good on you! If not, use a cookie sheet. 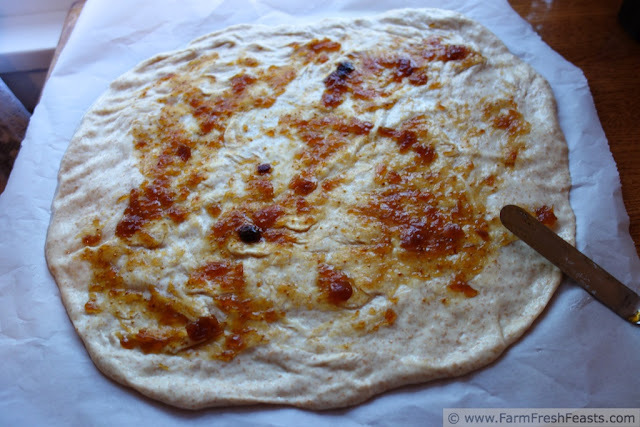 On an oiled piece of parchment paper, press the dough out into a rough semblance of a circle (see how I did it here). Soften the jam by warming it in a microwave for 15 seconds (or put the jar in a warm water bath for 5 minutes). Spread the jam over the crust, leaving a 1 inch border as the jam will spread when hot. Top with pear slices. Dot with goat cheese, and cover with shredded fontina. Bake for 8 minutes. Shake the pizza off the parchment onto the baking stone or cookie sheet. 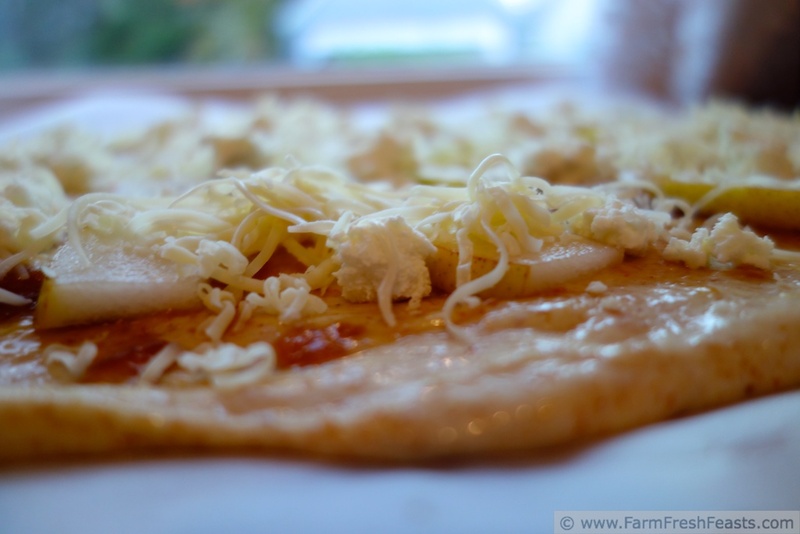 Continue to bake until the cheese is bubbly, about 4-6 minutes more. Cool on a wire rack then slice and serve. This post is in the Wednesday Fresh Foods Link Up at Gastronomical Sovereignty, What's In The Box at In Her Chucks, and linked with the Frugal Days, Sustainable Ways Blog Hop, Food on Friday and Foodie Friends Friday. I'm sorry, comments are closed on this post due to excessive spam. If you are real person, and you'd like to share your thoughts, please go to my FB page. I'd love to hear from you! Thanks! This pizza looks amazing. I love pears this time of year. I make a similar pizza with carmelized onions, pears and blue cheese which is phenomenal, but I think you might have me beat with this fig jam. It's sounds really delicious and I kind of wish I was eating some right now. Your Pizza Nights rock. Meghan, your pizza sounds wonderful. 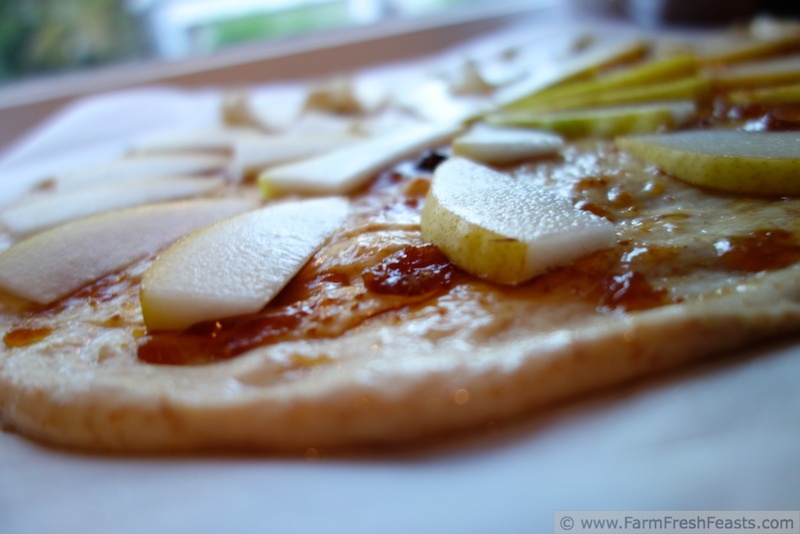 I've had caramelized onions and gorgonzola on a pizza, and I bet the addition of pears to that mix would be great. I used the second half of the pear with caramelized onions in another pizza, but with goat cheese as I had nothing in the blue cheese vein in my cheese drawer. Nice to have help! I haven't had pizza in weeks - months - so yours have to feed my fix and fixation! Alanna, clearly you have no one in your household demanding their weekly Pizza Night! It's not just the spouse, either. When he's gone the kids say 'aren't we having pizza?'. I could just have a bowl of cereal sometimes, but no . . . Gross? 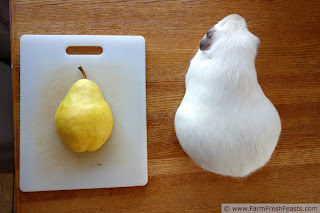 The composting pear-shaped pig?! He puffs up even bigger indignantly. The pig does a good indignant look, though his bewildered look is even better. Thanks! You didn't tell me how much fun this would be. I too thought "gross" when I realized you had put the guinea pig on a cutting board. We had a "pig farm" for a while, and ours were continuous producers of matter I never wanted anywhere near my cutting boards. The pig is on the table! The pear is on the cutting board! I can see the confusion, but wouldn't do that to my cutting board. Or my dear readers! I'm sorry! Our pigs are also prodigious producers, though I appreciate their compost. Outside. In the garden. Not in my kitchen. Worms are enough producers for my kitchen, but they aren't photogenic like the pigs, so they stay in their bin. 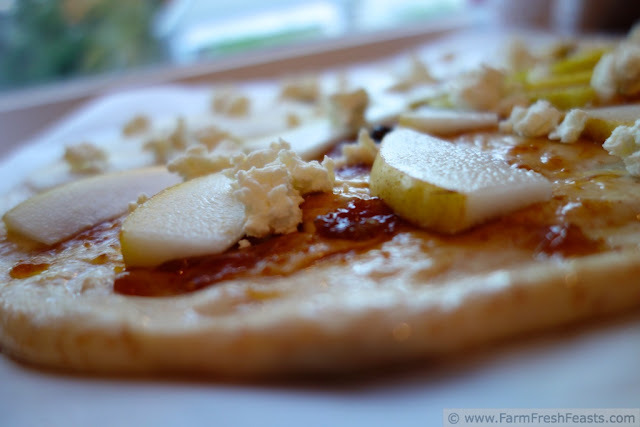 Fig jam with pears on a pizza sounds divine! Your child did a great job with the photography. Christin, thanks for stopping by! My photographer preened with your compliment. I hope you find some recipes you like! Britt, I hope you like it. Thanks for stopping by! Laura, I hope you do try it! Opens up a whole new world (sing with me) of possibilities. 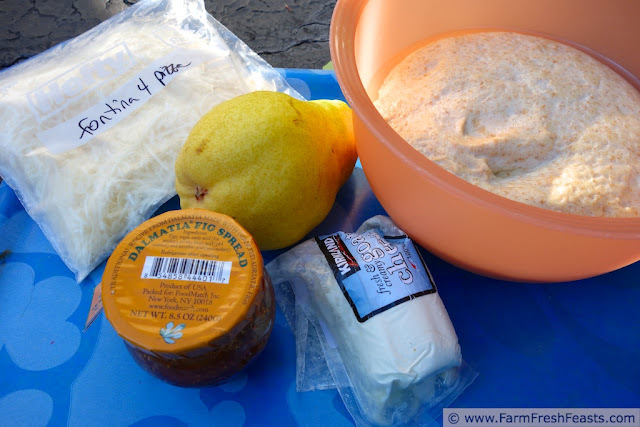 thank you for sharing with the Wednesday Fresh Foods Link Up! I looks forward to seeing you again this week with more wonderful seasonal & fresh/real food posts. xo, kristy. The big fat pig has been enjoying the CSA farm share for so long he can't help his pear-shapedness. Thanks for hosting, and thanks for stopping by! Heather, this sounds completely obnoxious, but I really prefer my pizza to most take out, and I don't usually think 'I can do this better at home' when I am out to eat! However, I will never miss an opportunity to eat Grotto pizza in Delaware, or Z pizza or Pie Tanza in Northern Virginia, and I learned the amazing flavor of a green olive on pizza from La Rosas here in Ohio. There's something to be said for taking a night off. Thanks for hosting and for stopping by! Thanks so much, I've been enjoying joining your party! This sounds amazing. I have never had a fig! Strange, I know. But your recipe sounds so inviting I may just have to buy a few soon! Thank you for linking up with Foodie Friends Friday! Hope to see you again next week. I'd only had dried figs, which are . . . okay . . . until our CSA farm in Virginia gave us fresh figs for a few weeks as part of the CSA share. Oh, my! Whenever we stop moving frequently, if wherever we live can handle it, I'm planting a fig tree. There's something about a fresh fig! It's delicious. That being said--the fig spread I use (photo above) rocks. Delicious with goat cheese and prosciutto in a panini . . . I'm drooling again. I love pears too--and look forward to the ones from my farm share--local, sweet, and delicious.